Keith Anderson and Bobby Hitchcock decided to join the air search for the missing Fokker of Charles Kingsford Smith, using Anderson's Westland Widgeon 2-seater light plane which had long range tanks installed for an attempt at the world endurance record. The Widgeon was not a suitable aircraft for such a search and its Cirrus engine had known reliability problems. At about 7:25 pm, over the Tanami Desert, the Widgeon's engine lost power owing to the loosening of a push rod, and a crash landing was made in inhospitable surroundings. On 24th, April, 1929, in company with Flight Lieutenant Eaton and Mr Moray, I left Wave Hill station en route to the bodies of Lieut. Anderson and Mechanic Hitchcock, in the vicinity of their Westland G-AUKA aeroplane. I arrived there at one (1) o’clock P.M. on the 29th April,1929. The bodies were situate about eighty (80) miles, direct air line, East South East of Wave Hill. The body of the mechanic Hitchcock was lying under the right wing of the aeroplane. The body was lying on its right side, with the head resting in the palm of the hand. Through being decomposed, the features of the man were unrecognisable, but deceased had brown hair, round features, and was about 5 feet 7 inches, or 5 feet 8 inches in height - stout built. There was also a bandage on the left leg of the body: this, and the fact that he left Alice Springs with Anderson after treatment at the hospital there led me to the conclusion that it was Hitchcock's body. The deceased was not personally known to me. The registration marks and name on the aeroplane corresponded with the one for which Lieut. Eaton and myself were searching. After a further search round we found the body of Anderson about four hundred and forty (440) yards from the machine. Papers close to the body showed him to be Lieutenant Keith Anderson. Deceased was unknown to me personally. In company with Lieutenant Eaton and Mr Moray I buried the bodies. 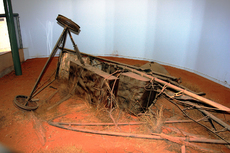 The wreck of their plane can be seen today in a museum at Alice Springs.